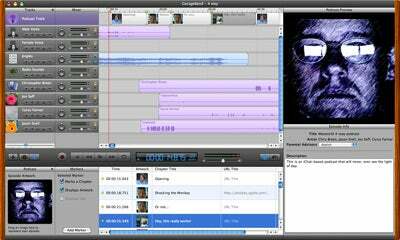 Musically inclined Mac users—from professionals who need an easy-to-use music sketchpad to amateur enthusiasts who just want to string together prerecorded loops—have been entranced by GarageBand. Unfortunately, if you don’t have musical leanings, you’ve probably given the program little more than a glance before proceeding on to iLife’s other offerings. That’s about to change. With iLife ’06 , Apple has repositioned GarageBand: While its musical capabilities remain (with some minor enhancements), its marquee features—outlined in this first look —now focus almost entirely on the creation and distribution of podcasts. For the most part, these tools are intuitive and capable of producing a professional-quality podcast, even if you’ve never made one before. Evidence of GarageBand’s new focus is clear from the moment you launch the program. When you do, the app presents you with four choices—New Music Project, New Podcast Episode, New Movie Score, and Open Existing Project. It’s the second option that’s most interesting in this latest edition. Select it, and you’re greeted with a GarageBand window that features five tracks: Podcast Track, Male Voice, Female Voice, Jingles, and Radio Sounds. Selecting Podcast Track lets you enter elements—including artwork, a title, an artist name, and an episode description—that will eventually make their way to the RSS feed used to publish your work. The Male Voice and Female Voice tracks serve to record a Podcaster’s voice. Each has been optimized—with effects including equalization, noise reduction, and compression—to bring out the best tonal quality in each type of voice. The Jingles track is where you insert background music for your Podcast. You can choose from over 100 royalty-free musical passages supplied by the program, in a variety of styles and lengths, or you can add your own music loop or audio file. Finally, the Radio Sounds track is where you can record sampled sounds mapped to GarageBand’s Musical Typing keyboard—to add sound effects to your Podcasts. If you select this track and then the Musical Typing command from the Window menu, you can use your Mac’s keyboard (or a MIDI keyboard) to trigger the sound effects mapped to these keys. You can also choose different sound sets, such as Comedy Noises or the atmospheric Transoceanic set, in the Sound Browser pane. To make all those tracks live in harmony, GarageBand now includes a ducking feature. When enabled, it automatically reduces the volume of a backing track when a lead track kicks in. For example, if a musical bed begins your podcast, the music will fade when you begin to speak. You use simple arrow keys to designate lead and backing tracks. Although you can customize the degree to which a backing track is ducked, finding the right slider isn’t easy, and Apple’s Help offers little help. On my dual-2GHz Power Mac G5, ducking worked reasonably well. Some users may find that the ducks start too abruptly and return to full volume too slowly. Thankfully, you can draw your own ducks with a track’s volume curve controls. Once your podcast is done, getting it out to your eager audience is easy. Using the Share: Send Podcast To iWeb command, I was able to post a short podcast to an iWeb page with no problem. However, posting a podcast that ran just short of an hour took two tries: on the first try, iWeb gave me an error message when I attempted to upload the podcast (saved as a Spoken Podcast file in the Export preference pane) to my .Mac account. A subsequent attempt to publish it was successful. Overall, the mixing, converting, and posting process took about 40 minutes for the longer podcast. iChat to Podcast GarageBand makes it easy to incorporate iChat conferences into a podcast recording. GarageBand also now makes it easy to incorporate online audio conferences into your podcasts or other projects. In the past, recording such conferences was a chore. GarageBand makes it easier, thanks to its integration with iChat. With an iChat audio or video chat started, simply click on GarageBand’s Record button—each participant’s voice will be recorded on a separate track. In an audio-only chat, the icon of each participant appears in the Podcast Track as he or she speaks. For video chats, a screen capture of each speaker appears when that person pipes in. Although my first test produced tracks featuring only my voice, relaunching both iChat and GarageBand fixed that. The iChat integration worked remarkably well on my fast Mac over a speedy broadband connection with three others on a videoconference. Another noteworthy new feature is GarageBand’s New Movie Score option, which lets you import movies into a special Video Track for creating accompanying GarageBand scores. It works well with short clips, but some hour-long clips I imported stuttered badly during playback. As a musician, I’m a big fan of GarageBand. No program I own makes it as easy to create great-sounding music (and lets me have so much fun doing it). GarageBand’s latest features bring that same ease of use and sense of fun to creating and distributing quality podcasts. And that should be music to any aspiring podcaster’s ears.